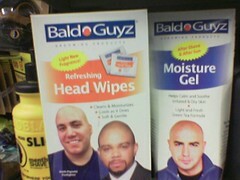 Bald Guyz brand refreshing head wipes and moisture gel. For bald guys, I guess. Yeah. Ha that’s awesome. Where did you see this? This would be perfect for my dad. This was CVS at 17th and P St NW. Amy and I had to do a double-take, then we started laughing.